Ordinarily, sights of March here in the Northern Hemisphere would include sprouting daffodils, singing robins and light-weight jackets. 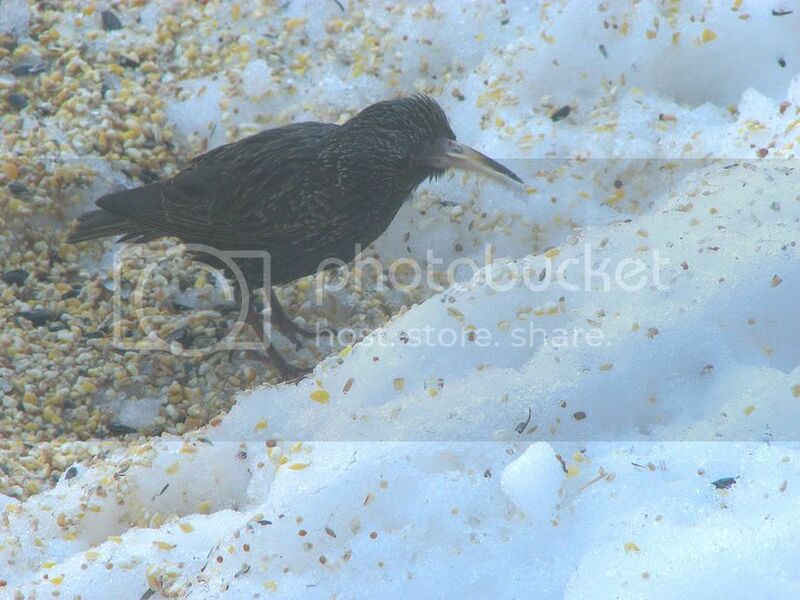 Robins have been spotted but snow still covers much of the ground where they're usually seen tugging at worms. If you're finding signs of spring, could you please send them my way? Until then, please enjoy a few of my random photos taken over the month of March. Please click each image to enlarge them. 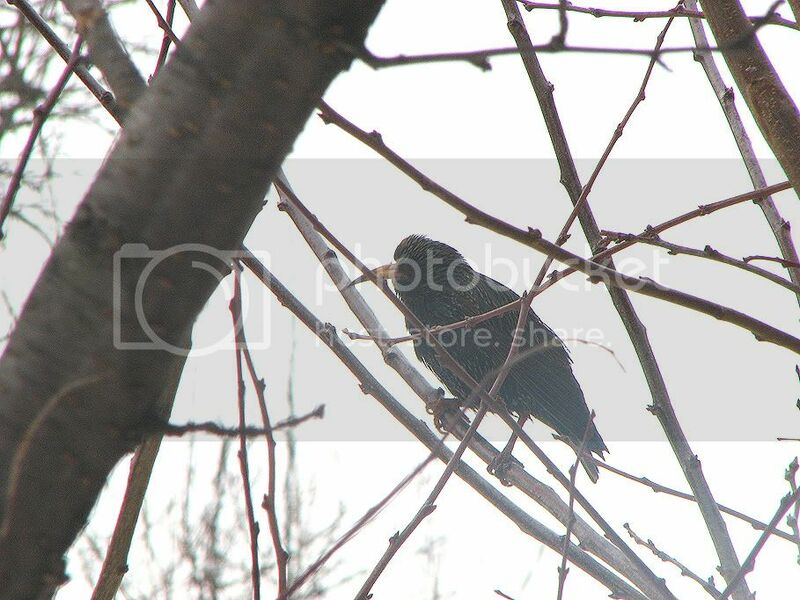 This starling has been visiting my feeder for the past couple of weeks. We are perplexed by the length of its beak. Both photos were taken through double glass doors. Perhaps it's not the same bird each time after all. If anyone knows whether some starlings just have beaks this long, can you please let me know? 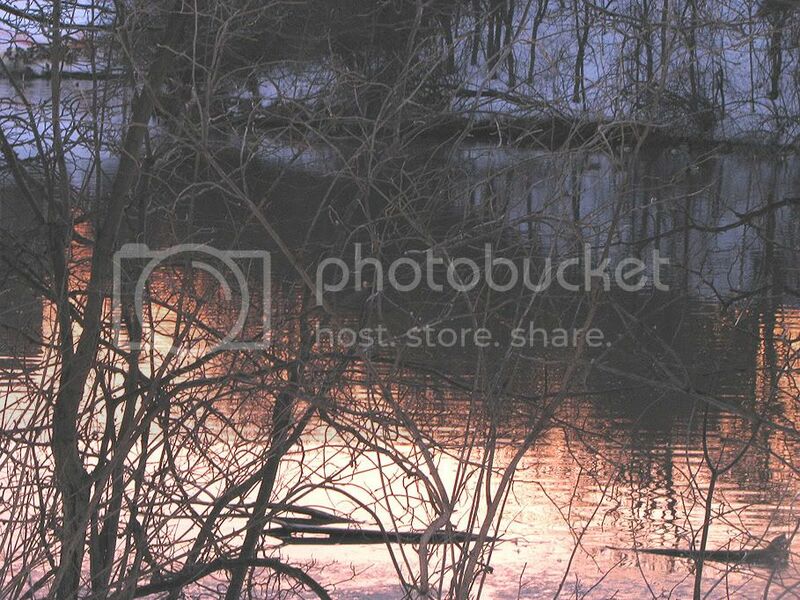 Through the branches, the sun sets on the pond near my house. Out walking near the creek on a sunny day. The water reflects the deep blue of the clear sky above. 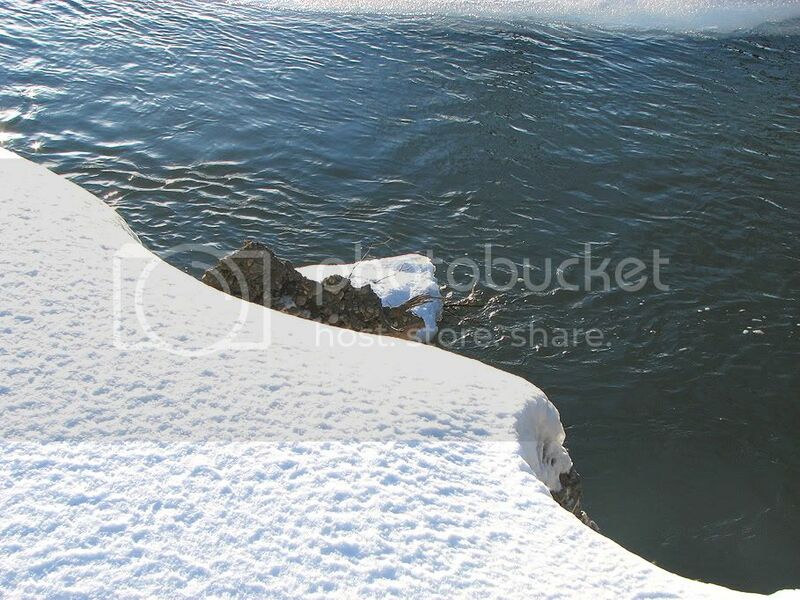 The snow-covered embankment contrasts sharply against the water's edge. In the cedar grove, we leave one of many peanuts for the squirrels or birds to find. Frank and Benny, walking away from the grove. 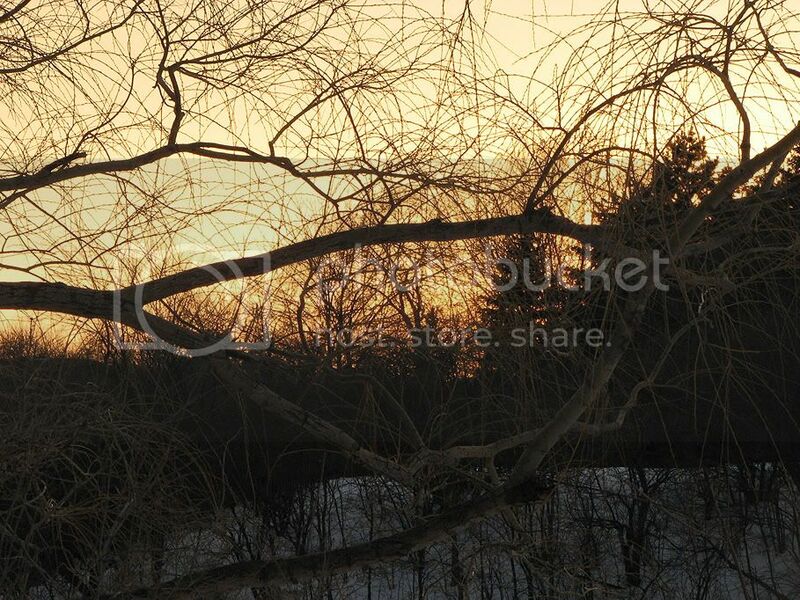 The setting sun shines on the snow and competes with contrails in the sky. 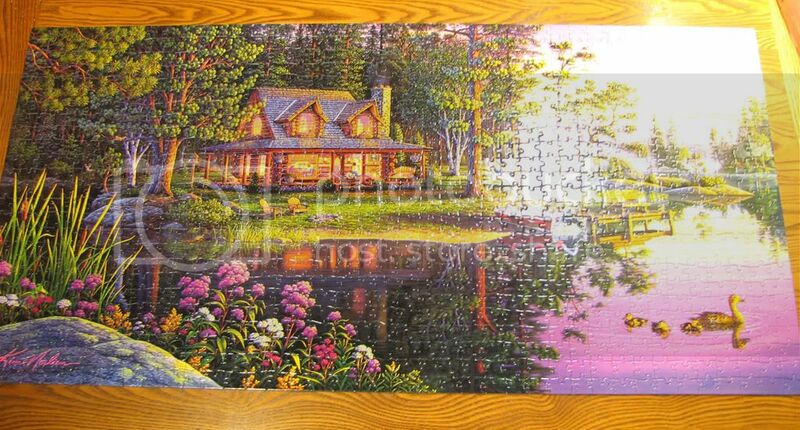 Back at the house, we worked on a colourful summer scene puzzle, once our cold fingers regained their mobility. 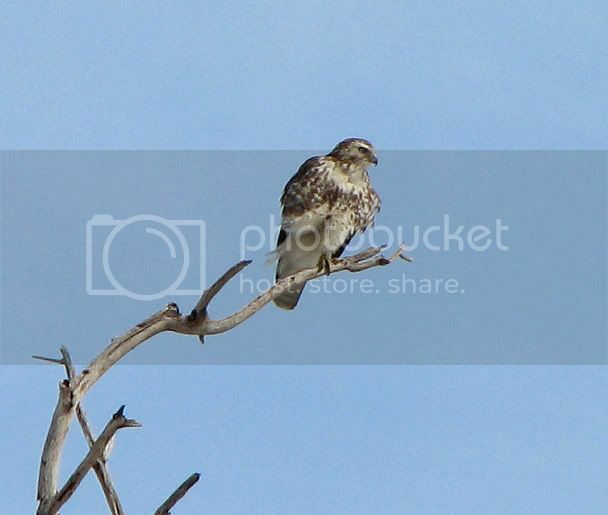 Head on over to Frank's blog for some of his beautiful late winter to early spring images. You'll be glad you did. This is the Final Part of the two previous posts "Things That Go Bump in the Night." You can either scroll down for two posts, or find Part One here and Part Two here. Depending on the reason, it can be anything between mildly frustrating and seriously infuriating when somebody hangs up on you. In this case, I met the situation with anger and bewilderment. 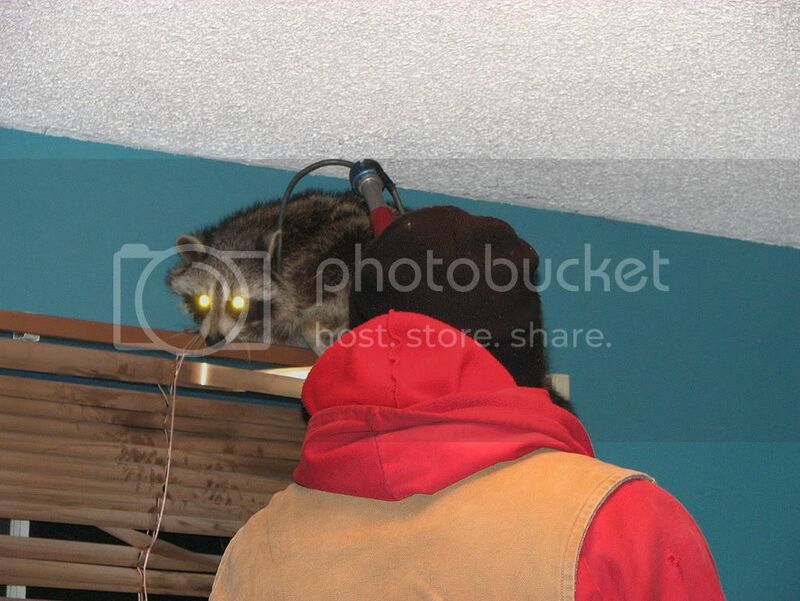 I had just been told that I would have to deal with a mother raccoon trapped in my house without the help of experts. She was confused, frightened and desperate to see her babies, who were nestled in a bucket on the roof. I hung up the phone and stared in disbelief. Now what? I no sooner stood to see how the raccoon was doing, when the phone rang. It was Sean, a supervisor over at the wildlife removal service. Evidently Mr. Nameless at least had the sense to let him know that he had just talked to one irate and very unhappy customer on the phone. Sean immediately returned my call to let me know that he fully grasped the urgency of the situation and that he was sending someone over right away. 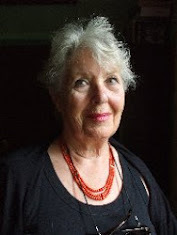 That someone was Sande, who also made a point of phoning to reassure me that he was on his way, but that it would take him about a half hour to forty minutes. 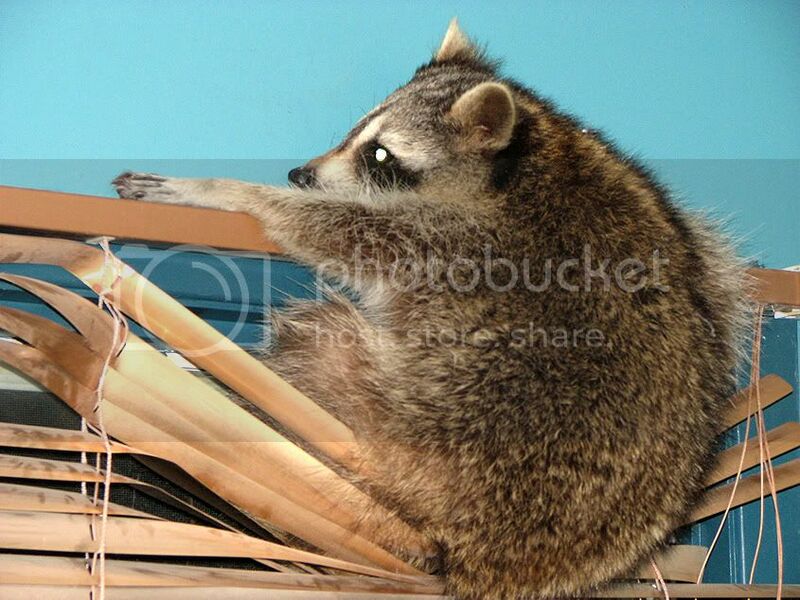 I felt very grateful and hoped that the raccoon could hold on until then. She did. We had the better part of an hour to kill before Sande arrived. I went next door to get my neighbour and friend Caroline. I knew that this was something she'd want to see. She and her husband Lloyd came over to share stunned expressions over the mess. Lloyd is from Newfoundland, and I mentally predicted the very words that he uttered. "Lard Tundering Jaysus! What in the hell happened here?" 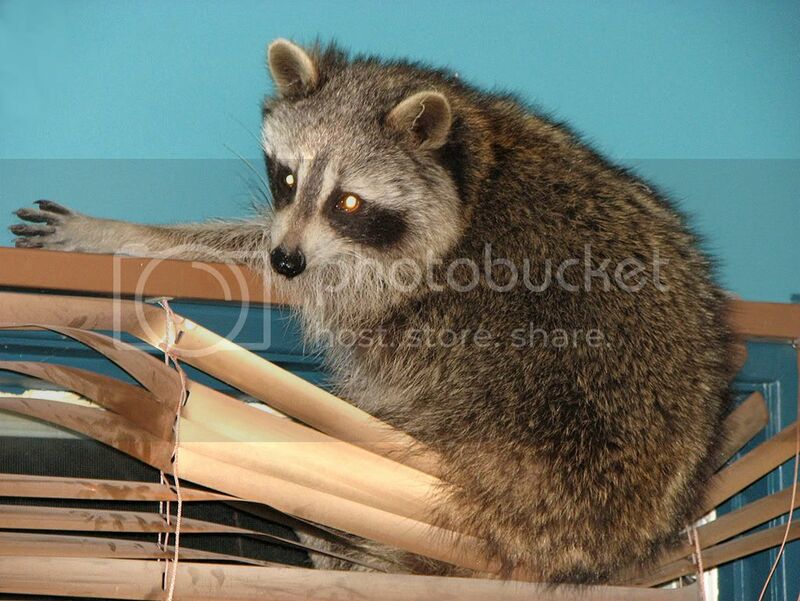 I guided them to Alex's room where the poor frightened mother raccoon continued to stare back at us. Lloyd and Caroline's daughter had an important hockey game to play that night, but Lloyd promised to return afterward to board up my ceiling. Shortly after they left, Sande arrived and set to work immediately. "Where are the babies?" I told him their approximate location on the roof and he climbed up there in the dark to retrieve them and relocate them to a sheltered corner of my front deck. I asked how many there were and if they appeared to be okay. He counted the same four that were there earlier that afternoon and reassured me that that seemed to be just fine. Sande then came into the house with one of those poles that have an adjustable loop on the end of it, so that he could capture the mom. He approached her slowly, and spoke soothingly to her. She began to panic. Amid much pole-biting, growling and flopping about, he managed to get the loop around her neck and cinch it. She fought like her life was at risk, and to her, it was. There was no way to communicate to this poor beast that we were going to set her free so that she could reunite with her babies. She hissed, growled and struggled until she manage to work herself out of the loop. She ran downstairs. Sande was adept at his job though, and soon had her cornered in my kitchen, this time fastening the loop around her abdomen. He guided her outside my front door and onto the deck where her litter of kits were blissfully asleep in the Rubbermaid tub. She continued her chorus of fierce noises and he persisted in trying to sooth her with his words. 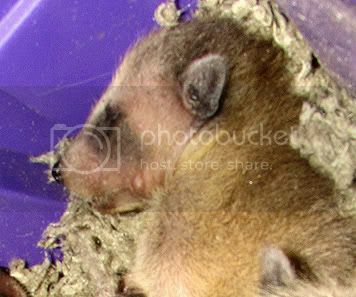 Out of exhaustion, she eventually calmed down enough for him to reach into the tub and remove one of her kits. He slowly brought the baby close to its mother and she snatched it from Sande's hand at the same time he released his hold on her. With her baby clutched close to her, she ran up and over the snowbanks on my front lawn, across the street and out of sight. Sande assured me that she would almost certainly return for her other babies through the night, once she found another safe place for them. He suggested that we keep away from the deck for tonight, but to check on them in the morning. He was betting that they'd no longer be in the tub. I thanked him profusely and told him how much I appreciated his concern for the creatures. He told me that he has spent time raising abandoned raccoon kits himself, so he felt quite confident when it came to handling them under this sort of circumstance. We chatted a bit more and he had me sign a "no charge" invoice before he departed, and I went back into the house to figure out what to do with the mess. Water was still dripping slowly into the bucket below. I retrieved my iPod and portable player speaker from underneath some of the mess. It escaped most of the wet insulation and works just fine. I picked up enough junk from the floor, nightstand, bed and from behind the furniture to half-fill a garbage bag. I stripped the bed of its covers and pillows, pulled it from the wall and vacuumed everywhere. 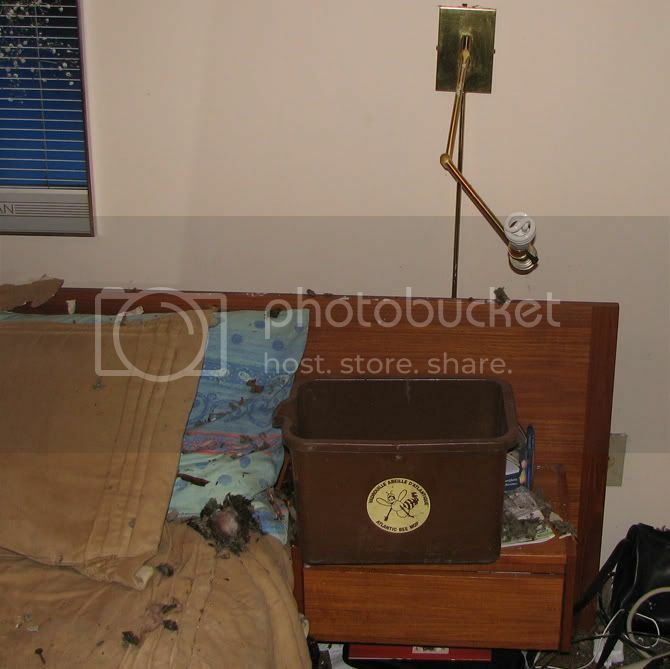 Aside from the ceiling and roof, the damage was restricted to the lamp, the nightstand which seems to have become discoloured from the water (perhaps raccoon urine) and the blinds in Alex's room. As promised, Lloyd returned around midnight with large sheets of plastic which we placed over the bed, nightstand and floor. 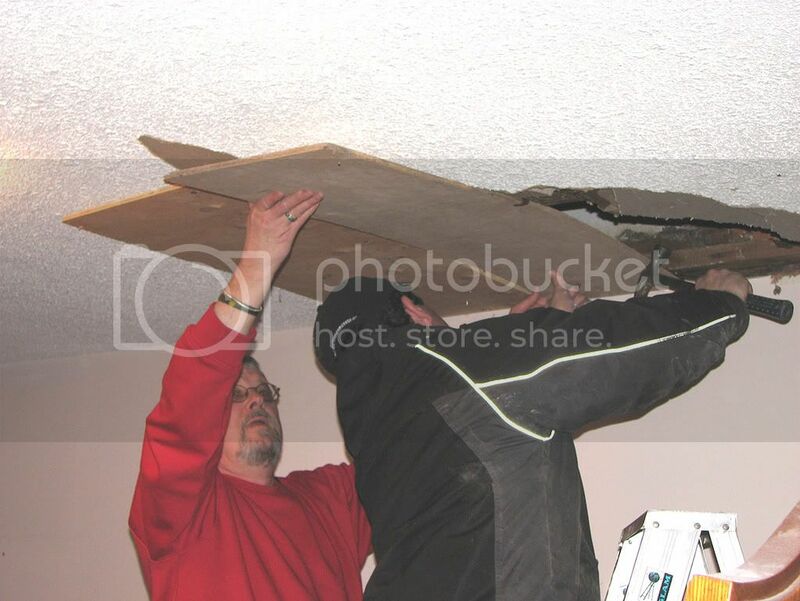 He then proceeded to remove the excess debris that was still hanging from the gaping ceiling. A few loose pieces of plaster and drywall were taken down to make the job of covering the hole easier to do. Lloyd located the beams and with Frank's help, expertly nailed a few sheets of plywood to cover the unwanted skylight in my room. He then stapled another plastic sheet all around it to give it a tight seal from the cold air and moisture. I filled another trash bag and a half with the excess debris and the plastic sheet, and then vacuumed again. My room was toasty warm all night - a testament to the quality work that Lloyd does. Early the next morning, I just had to head outside to see if the babies were still in the tub. 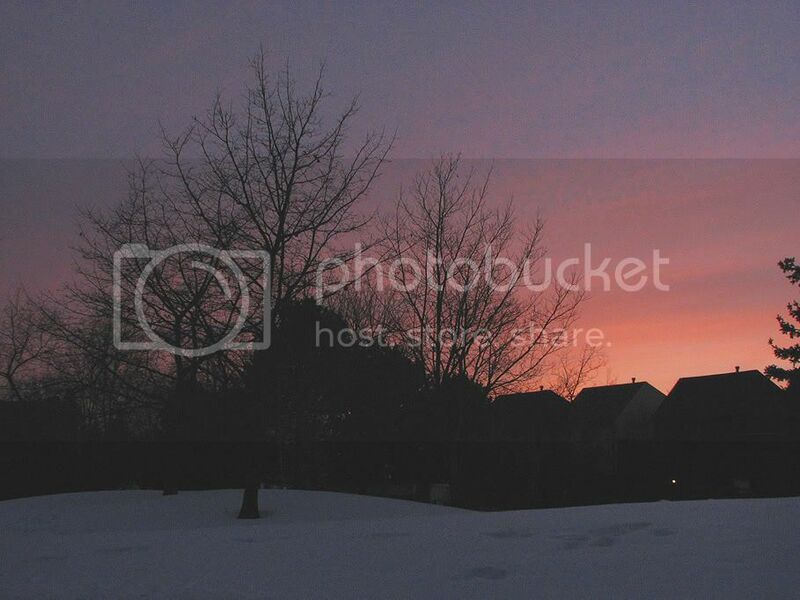 I grabbed my jacket and went out on the deck. I slowly peeled back the protective layer of insulation and saw only more padding beneath that. I touched and gently poked it all over the place but the tub was empty of baby raccoons. The mother had retrieved them all, and I breathed a sigh of relief. For a second or two, I thought I heard the familiar chatter sound that they make, but chalked it up to my tired mind playing tricks on me. The sound is not unlike some birds, so that was probably what I'd heard. I went back inside to make tea. 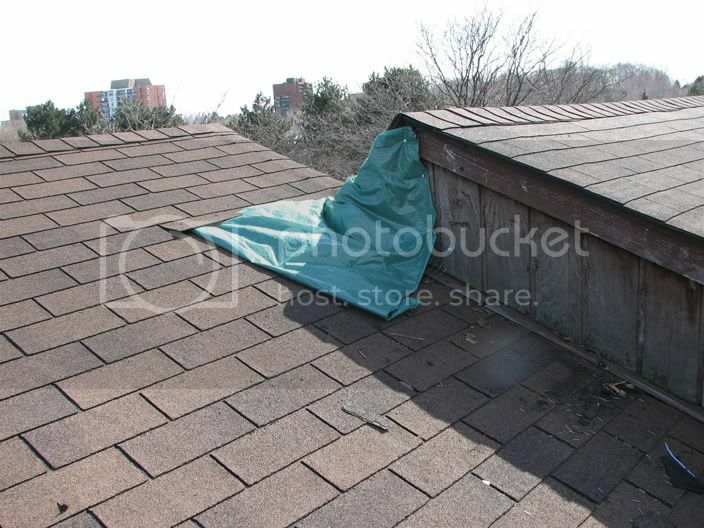 Later in the day, Lloyd climbed up onto the roof with my camera, to take pictures of the hole (with the one-way door in place), and to lay a tarp over it as required by the insurance company. They'll send someone out today or tomorrow to investigate the situation. 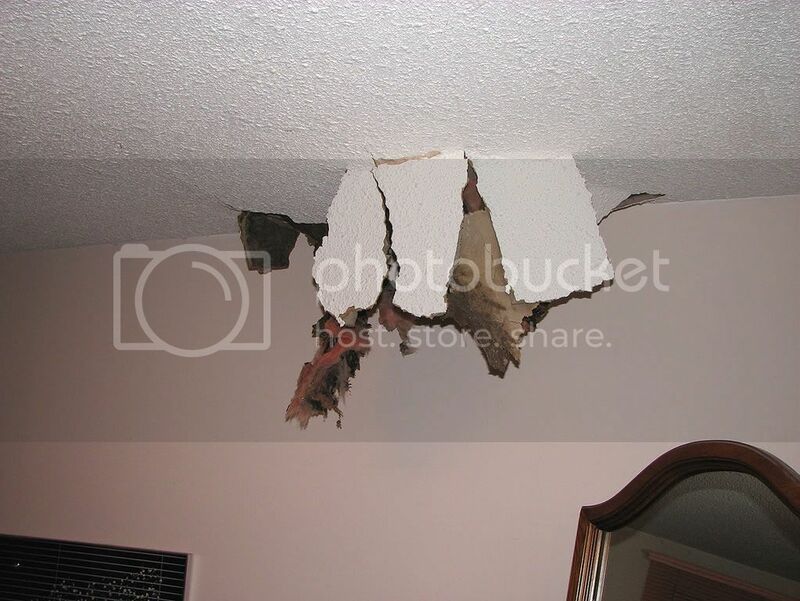 I hope to have the roof and ceiling repaired shortly. I glad that Frank was here for an early weekend visit. He usually arrives on a Friday, but decided to come out on the Thursday for the long weekend. I wouldn't have been able to keep reasonably calm on my own, and his suggestions certainly helped to minimize damage. Thanks, Frank. I'm grateful for wonderful neighbours that are always reliable. That hockey game ran late, and Lloyd was tired but he returned to help me out of a jam. Thanks, Lloyd. I'm appreciative that the two K's (Kyle and Ken), supervisor Sean and rescuer Sande were all kind, caring and compassionate people who understood my distress and made the animals' safety a priority. I don't know what happened with Mr. Nameless, but I am glad that he ultimately made contact with someone who had a brain and who cared. I'm very relieved that this didn't happen a few hours later while I was sleeping. I'm so much happier telling this story, than the one that would start out with "I awoke to a face full of raccoon and wet insulation." I'm thrilled that the mother and her young were reunited safely. I'm thankful that this whole situation was as minor as it turned out to be. I got to thinking about the suddenness of it all. One moment we were chatting and playing cards, anticipating a quiet weekend, and then all hell broke loose. In an instant, everything changed. I related that to how the unforeseen happens to people all of the time with car accidents, fires and illness. My incident will be costly, inconvenient and frustrating - nothing more. I'm very thankful that in perspective, it was pretty small and really rather funny - at least in retrospect. 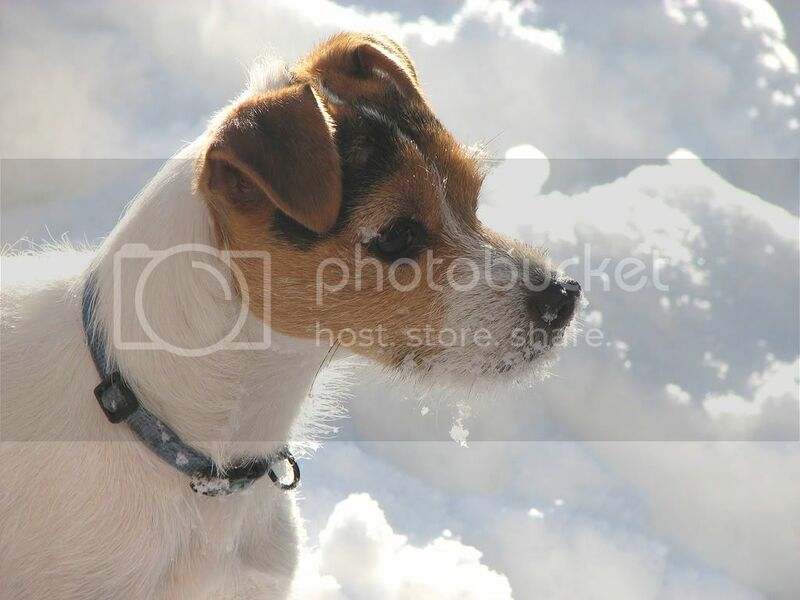 Epilogue: On Saturday afternoon, my son Jeffrey was playing around with Benny in the front yard - throwing small chunks of snow around for him to chase. 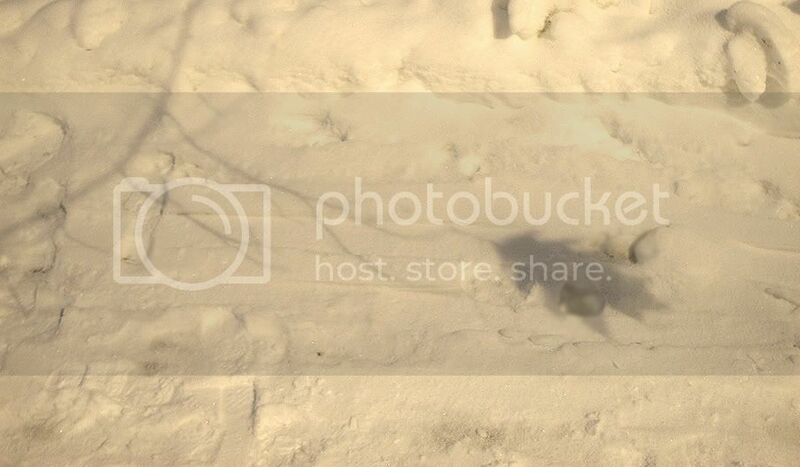 At one point he stopped tossing the snow and called me over to the deck where the kits' tub had been. "Do you hear this?" I did. It turns out that the chatter I'd heard that morning was not a bird. Mama raccoon decided to keep her babies close to home. This family of five now lives under my deck. 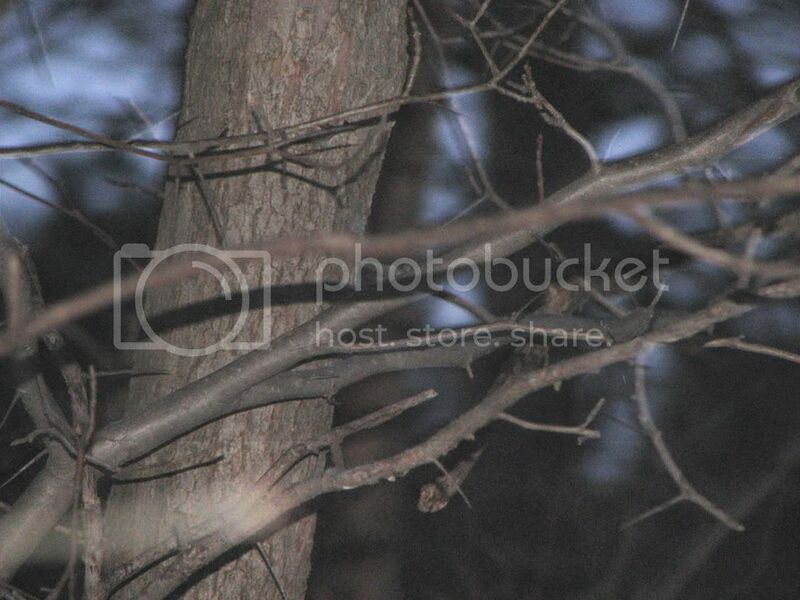 This is Part Two of the previous post "Things That Go Bump in the Night." With two cats who like to wrestle occasionally, crashing sounds are not all that unusual at my house. Benny was here for the long weekend and Raven was visiting from next door, and cat-chasing can be a very amusing game when bolstered by your best friend. So when we heard the crash, we scarcely reacted, assuming that one of them ran clumsily into a door while in chase-mode. The only problem with that scenario was that both dogs were playing quietly, right here with each other. Hmmm, what could have happened up there? Three seconds into pondering this, a series of hisses, spits, growls and yowls assaulted our ears. My cats play-fight with each other a lot, but they never react like that. I rushed to investigate. I headed upstairs to a continued chorus of angry cat sounds. Near the top of the steps, both cats had their backs to me and were staring fixedly toward my bedroom. Their tails were enormous, as cat tails get when felines are extremely angry or fearful. A split-second later, a third bushy tail rushed past them from my bedroom into my son's room. I let out a short string of mild to moderate expletives, and yelled downstairs to Frank that the raccoon was in the house. My mind reeled as I tried to figure out how she could have gotten inside from the attic. While ascending the stairs and shooing the cats, and the now curious dogs away, I surmised that this desperate creature must have seen how K brought her babies through the small door in the ceiling of my closet, and summoned up her maternal strength to lift it out of place and follow their scent. I knew that wasn't logical because according to K, she had already seen her babies on the roof right by the newly-built, one-way exit. She had also supposedly escaped the attic at that time and she really couldn't lift that door, so none of this made any sense. But what else could it be? I rounded the corner and stole a quick glance into my bedroom. A long string of moderate to censor-worthy expletives escaped my mouth as I looked up to see this gaping, dripping hole above my nightstand. Frank was soon behind me, helping me to assess this situation, deter cats and dogs from approaching the raccoon in Alex's room and to shut doors to the other rooms so that we could isolate her as much as possible. At one point she ran back into my room where I have a balcony, and Frank suggested trying to usher her safely to the exit where she could then easily climb to the roof to reunite with her babies. The poor mom was in ultra panic mode (not unlike myself) and ran back to Alex's room where she climbed up on his bed, scurried along his headboard, up onto his desk, toward the window. And there she stayed, entangled in the Venetian blinds. The poor thing was terrified. I went back to my cold, dripping bedroom. 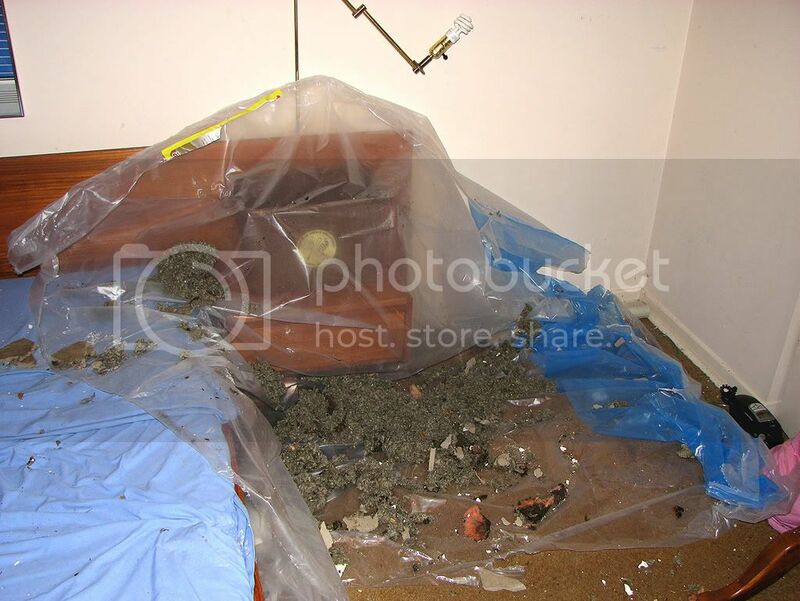 A growing heap of wet insulation, crumbled drywall and plaster chunks littered the nightstand, floor and bed, and the wall lamp was twisted off to the side like a badly-crippled limb. Following Frank's suggestion, I placed a bucket under the hole to minimize further damage. I located my phone and the phone number for the wildlife removal service who guaranteed their work for a full year. This had been a full seven hours. Surely they'd send someone out to help immediately. I spoke to a most unhelpful person. I could practically hear him scratching his head when I told him that I had a raccoon in the house and a hole in my ceiling. He asked for my location and determined that he didn't have anyone in my area right now and that the soonest he could get someone out here would be the following morning. "Tomorrow? ARE YOU KIDDING ME???" My panic increased, as did the volume of my voice. I knew that because I looked up a couple of times to see Frank giving me the "tone it down" signal with his hands. At the same time, the guy on the phone was also telling me to calm down, try to forget about if for now and just deal with it tomorrow. 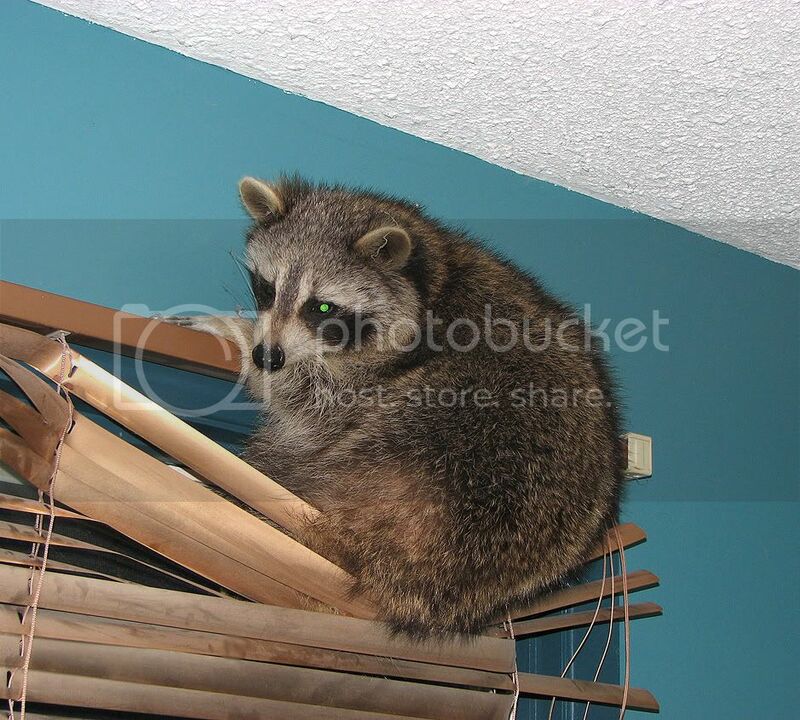 Once again, I explained that I didn't just have a raccoon isolated in my attic anymore, but that she's clinging to the blinds in my son's room. I expressed very clearly that I needed him to send someone out here immediately. He repeated that he would have someone come out in the morning. I tried one last time. "I have a RACCOON in my HOUSE. She's scared, her babies are alone on the roof (this is where I blew it for K. It slipped out before I could think clearly. I'm so sorry.). This HAS to be taken care of tonight. You advertise 24/7 service." Once again, he repeated that he couldn't do anything until morning. I asked for his name and he told me "That's not important." I tried to let him know that it was going to become important, but at that point he hung up on me. I was livid, worried and totally unsure of what to do next. 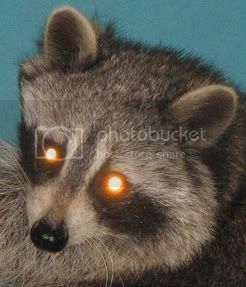 I did not want to further traumatize the raccoon. I didn't want to call in anyone that wouldn't also take her life and her babies lives into careful consideration. I was afraid for any of us to try to handle her ourselves. My son Alex was going to come home soon to find a raccoon in his bedroom and my older son Jeffrey was about to arrive home for the long Easter weekend. 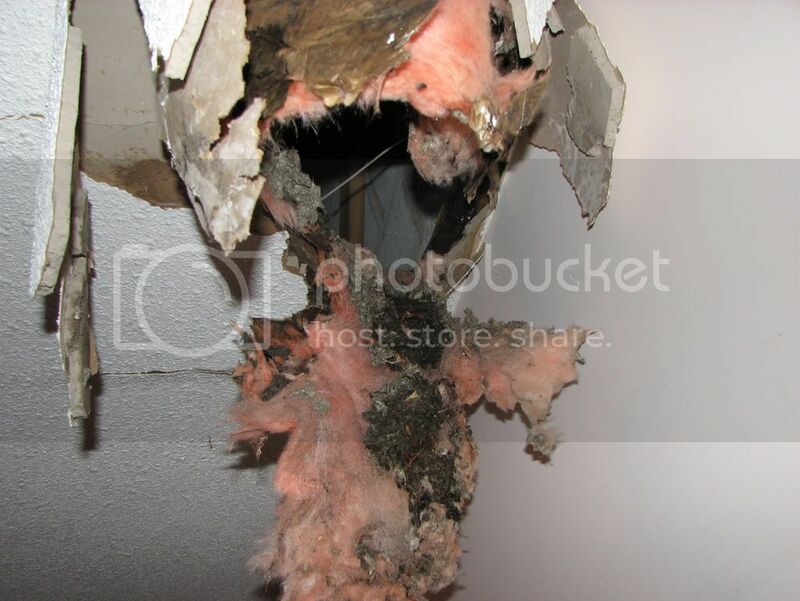 My ceiling continued to drip, and drop chunks of insulation, drywall and other debris. 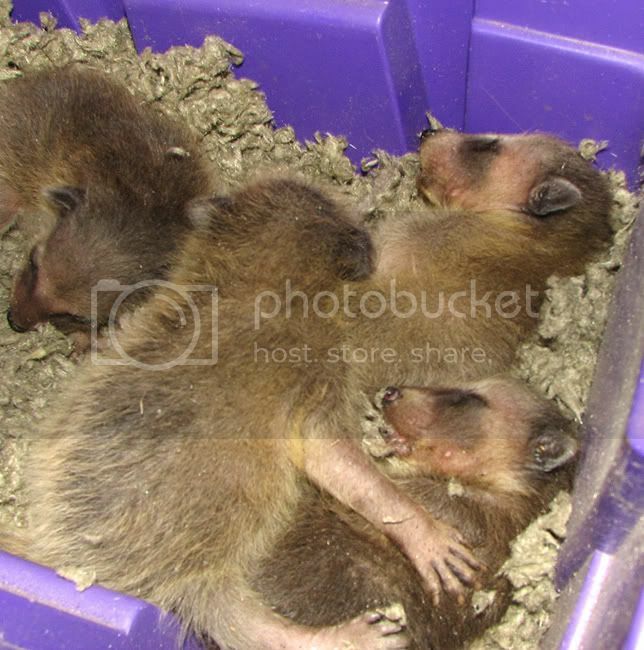 There was a raccoon clinging to the blinds and four hungry babies in a bucket on my roof. And then my head exploded. About a week ago, I awoke to hear a series of persistent bumps, thuds and scratching sounds coming from above my bed. The scratches turned into scrapes which in turn became more of a ripping sound. My guess was that a raccoon was trying to get into the crawl space-sized attic in order to find shelter from the windy night. I heard the ruckus intermittently through much of the night and by morning, I had circles under my eyes that could compete with the little bandit who had caused my sleeplessness. Nobody else had heard it and it didn't seem to reappear for the next few days so I put it out of my mind - mostly. The critter reappeared late Wednesday with some distinguishing scratching, walking and chuttering sounds. I asked my friend Google to help me find a simple, safe and humane way to rid my home of this potentially destructive animal. Several of Google's offerings suggested spreading mothballs or ammonia-soaked rags in the area (but not if I suspected there might be babies as it can damage their mucus membranes), setting a radio to a talk show and playing it loudly, and shining a bright light in the space. The only access to my attic is through a small wooden entrance in the ceiling of my closet. There are no stairs leading to it. To get inside, I'd require a ladder, a flashlight and dexterity - along with a fearlessness of heights, small spaces and confronting a wild animal under those conditions. I had the ladder and the flashlight. The rest not so much. 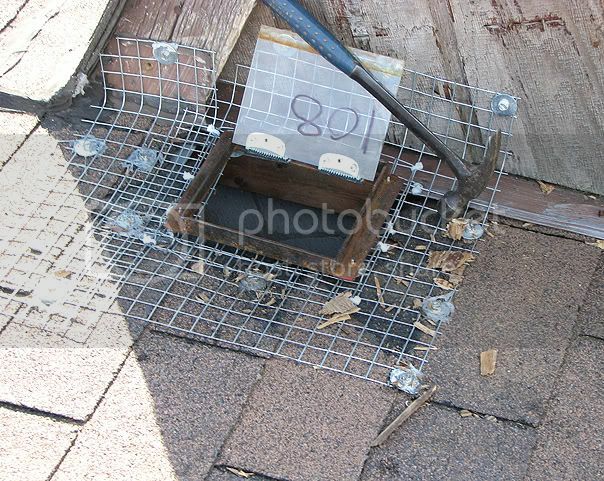 Google also impressed upon me, the understanding that raccoons can do a great deal of damage, and with this being nesting season, I figured it was wise to call in the professionals. I'd heard about a wildlife removal service that had the reputation of employing a particularly humane approach, and so I phoned them early yesterday morning. 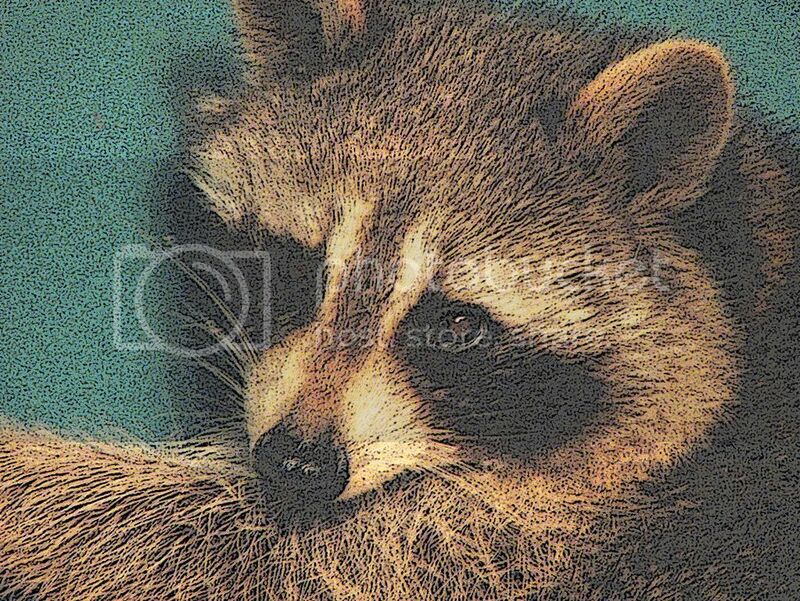 The woman was up front about the costs of their service which would include removal of the animal, removal of any young that might be present, relocation of the young so that the mother could find them, and placement of a one-way door at the raccoon's point of access. There were additional costs for each roof vent and exhaust that would require screening to prevent the animal's return. A quick estimation in my head told me that I was looking at upwards of $500. She told me that they could have someone here by the afternoon, and I was grateful that I wouldn't have to spend another sleepless night. Ken and Kyle, two friendly, young guys arrived even earlier than expected in their bright yellow van. After asking a few questions they set their ladder up at the back of my townhouse and inspected the roof for holes. It was clear to them that the raccoon had entered by a large opening it had created at the juncture between my roof and my neighbour's. They brought their ladder inside to my closet and hopped up into the attic with the agility that I so clearly lacked. Their muffled voices indicated that they had found the culprit. Ken or Kyle (since I don't know one from the other, I'll just call them K) poked his head back out of the attic to ask me if I could find a small box for them. I asked if they had found babies and K told me that she had in fact had her litter in my attic. The plan was to bring the babies out through the house but to leave the mother trapped inside temporarily, put the one-way door in place and hopefully reunite mother with babies once she escaped through her new exit. 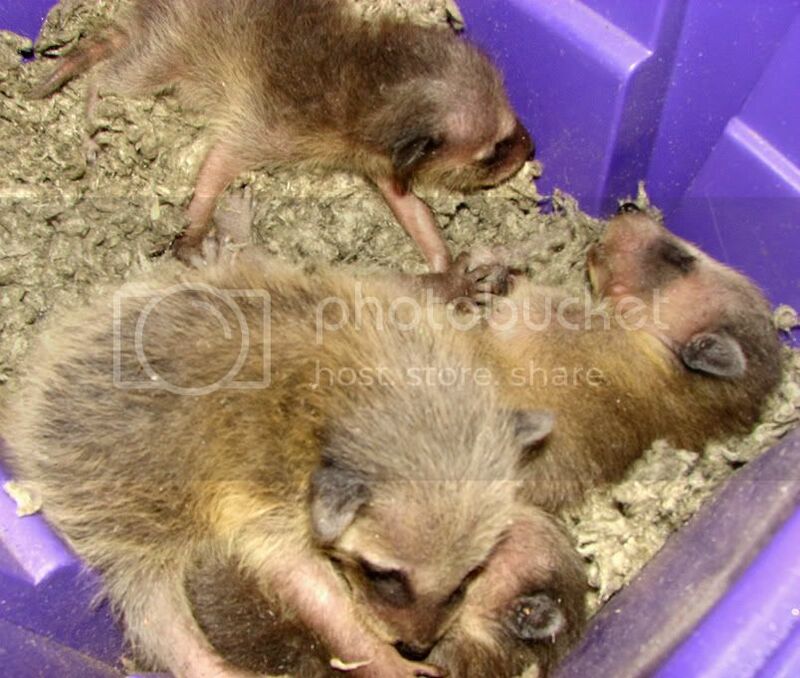 I emptied a Rubbermaid box that had just been holding some junk in the garage and handed it to K. A moment later he emerged with the box full of insulation and four adorable baby raccoons. I oooed and awwwed over them for a moment, and resisted the strong urge to touch them, knowing it was not wise. K stroked them with a gloved finger and agreed with me that they were beautiful little creatures. I was happy to see that he genuinely cared about their welfare. He covered them up with more insulation and a loosely-placed garbage bag, and set about finding a safe spot for them in a sheltered corner of the back yard. After screening off all of the roof vents K spoke with his supervisor who suggested that once the mother emerged through the one-way door, it would be best if she could find her young nearby. The two Ks worked together to secure the box to the roof and even before they descended, they saw the mother raccoon exit the attic and discover her litter. K also asked me not to mention their location to whomever I spoke to in a few days when I'd make the appointment to have the one-way door removed. That was above and beyond what they were supposed to do, and their extra effort might not be appreciated by their boss. I understood, was very appreciative of their caring natures and told them that I would remember not to mention it. That was a promise I ended up breaking (sorry K). I was instructed to make a phone call to their office in about five days, when I was certain that the raccoon activity had ceased. Someone would come back to remove the one-way door and place some more screening over the hole. It would then be my responsibility to get the roof repaired. I worried about the safety of the young and hoped that the mother would find a new, secure location for them quickly. This being a long weekend, I was expecting my son Jeffrey to arrive home from university in a few hours. Frank makes the best beef ribs ever, and Jeffrey has the best beef rib appetite ever, so there was no guessing what was on the menu for dinner that night. Frank set about simmering ribs and I poured myself a drink and we soon settled into a game of cribbage. That's when we heard the CRASH! Today has begun as it often does for me - with a cup of hot spiced Chai. I've been hooked on this delicious tea ever since I was introduced to iced Chai about seven years ago. At that time, there weren't any commercial brands available on the grocery shelves but I spoiled myself from time to time at Starbucks or other gourmet coffee shops. In recent years, it seems that every tea manufacturer has at least one blend of my favourite tea available, and so my cupboards are full of various brands which were purchased in pursuit of the tastiest one. It turns out that they're all pretty much the same, so lately I'm sticking with the widely available Lipton's. With a bit of honey and a splash of vanilla, its milky smoothness is the perfect morning alternative to coffee. There have been other mornings this winter when tea or coffee were not the first sips of the day, and I thank blame Frank for that. This winter has been a cold and snowy one, and despite subtle signs of spring, it's not quite over yet. There have been mornings with windchills of -25 Celsius (-13 Fahrenheit), and though layers of clothing sure do help keep us warm on the outside, a little something extra is occasionally desired required for the inside. So we've been known to fill a small, pocket-sized bottle with experimental mixtures, perfect for sipping while out walking early or late in the day. Frank claims that I "hog all of the belly-warmer," that my sips are actually gulps, and that his mini-bottle usually lasts him three ventures into the woods when he's alone. The bottle only holds 100ml (just over 3 ounces), so I suppose anything more that a lip-wetting would make a significant dent in it. Besides, it's his own stroke of brilliance fault for even introducing me to the concept of drinking alcohol in the morning. Of course these sweet mixtures are not exclusive to morning and evening strolls into the woods. They're just as delectable served on ice in a tumbler, and we frequently enjoy sipping on one during the course of an evening while preparing dinner, playing cribbage or while watching a movie. Part of the fun is in the guessing. One of us will mix the two, or sometimes three ingredients, and the other will try to guess which components have made up the flavour-du-jour. Usually, it takes several sips before we can determine what it is. Occasionally one or the other of us has mentioned that we really should keep track of the combinations that work. So far, neither of us have - at least not in writing. They're worth the effort though, so I'm going to share some of the better concoctions that Frank and I have discovered, and taken the liberty of naming. A ratio of fifty-fifty works well for most of them, but you may want to go heavier on the flavour you like best. Peppermint Pattie: Peppermint Schnapps and Creme de Cacao combined in such a way that you'd swear you just bit into a Peppermint Pattie or a Junior Mint - very refreshing! Jäger-Schläger: A combination of Goldschläger - cinnamon liqueur with the real flakes of gold and Jägermeister - a sort of fortified tonic. Even better if you replace the Goldschläger with the stronger-tasting Fireball (a flavoured corn whisky shooter). Hot Pepper: A spicy mixture of Fireball and Peppermint Schnapps. Wait for the burn! Pepperetto: A delicious marriage of Peppermint Schnapps (yes, it shows up in a lot of our drinks) and Amaretto. This one is my personal favouite. Black Forest Cacao: Creme de Cacao blended with Cherry Whisky. You'll have to imagine the whipped cream. Sambucca Sizzle: Combine Fireball with the mild, black licorice flavour of Sambucca for a surprisingly yummy taste. Also delicious in combination with many of the above, and with each other are: French Kiss (vanilla flavoured), Orange Brandy (tastes the same as Grand Marnier, but is much less expensive), Drambuie, coffee-flavoured liqueur such as Bolivar and peach-flavoured Southern Comfort. If you experiment with any of these mixtures, I'm sure you'll come up with something you'll love. Pour yourself a drink and come join me on a late-day walk as seen through my eyes and my camera - enhanced only slightly by the glow of a sip or two. 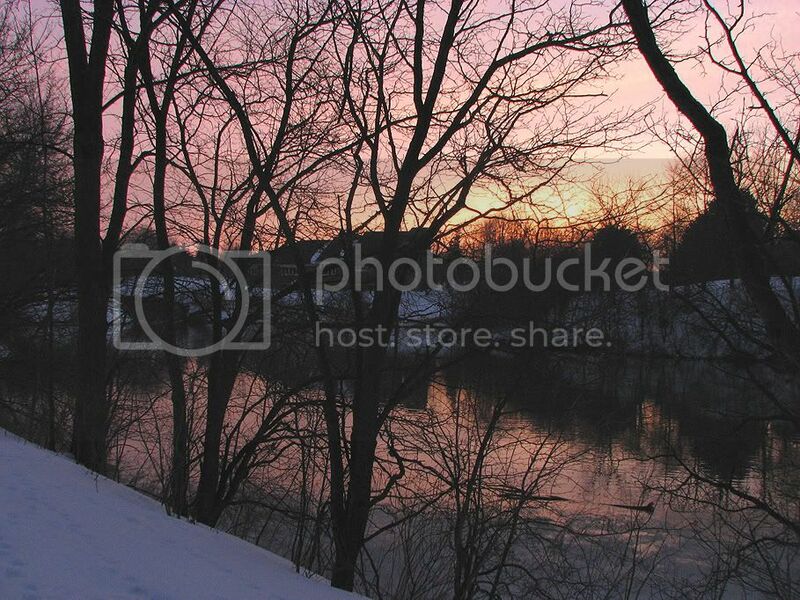 Please click each of the photos for their larger images. After walking through an open, windy field, we entered this lovely cedar grove at dusk. It was rewarding to take a break and bask in the warmth of the setting sun. 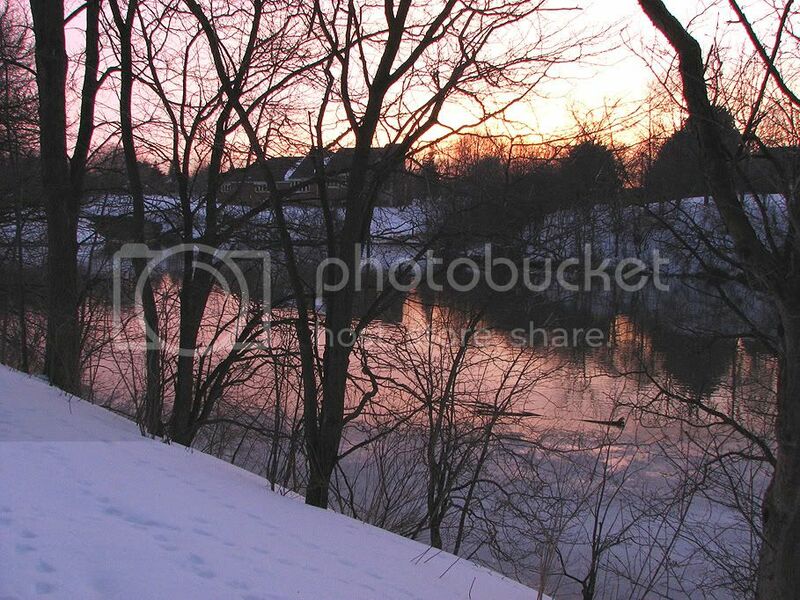 The early evening sun lends its glow to the creek which winds its way through most of the walking path. 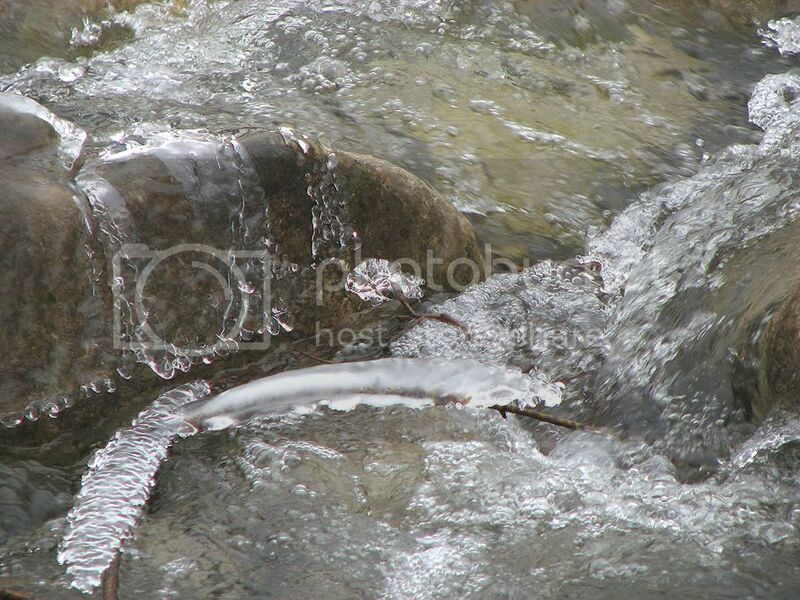 Though the water runs swiftly, the air is still cold enough to form ice clusters on the wet branches and rocks. 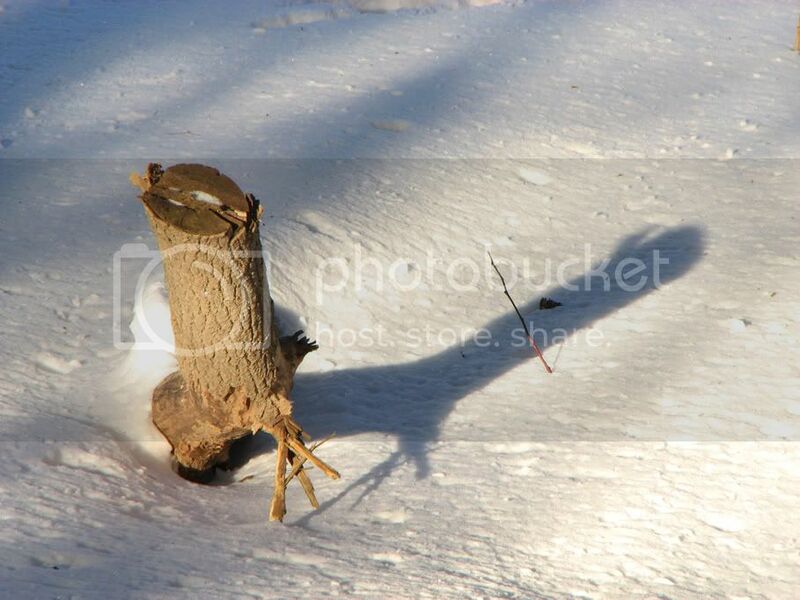 This tree stump seemed to glow in the light of the setting sun. A sign of spring! 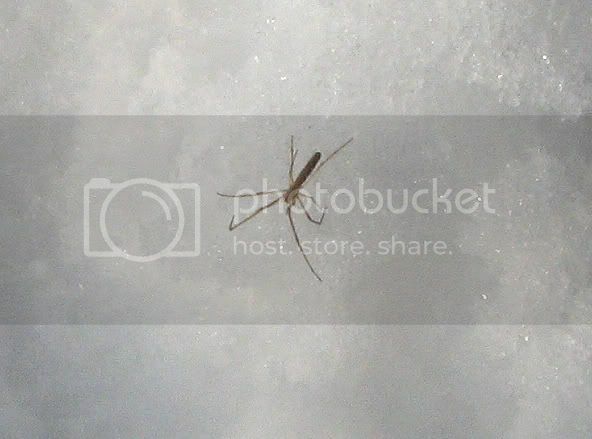 Frank told me about these tiny bugs the previous day when he first noticed them on the surface of the snow. 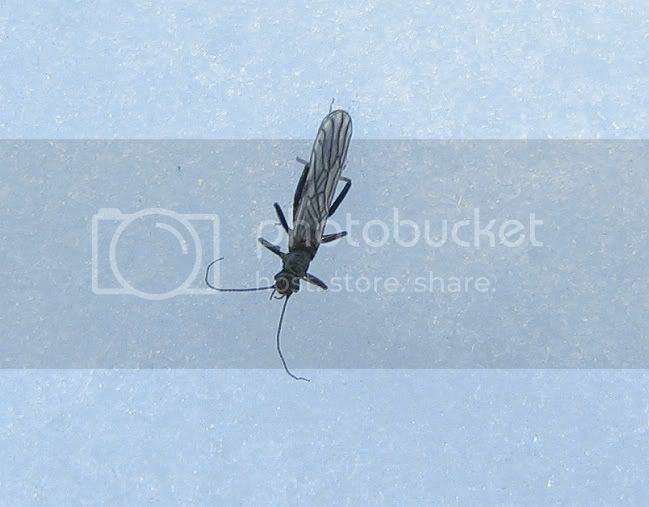 A bit of Googling and I learned they were Winter Stoneflies. Apparently they come out of the creek in the early spring sunshine, feed on vegetation, mate and lay their eggs back into the creek. It took a macro photograph to reveal that they actually have wings. We also saw this snow spider. Inevitably, whenever I tried to photograph subsequent bug sightings, SOMEBODY came running to trample the surrounding snow, burying them in the process. But who couldn't forgive this adorable snow-covered face? 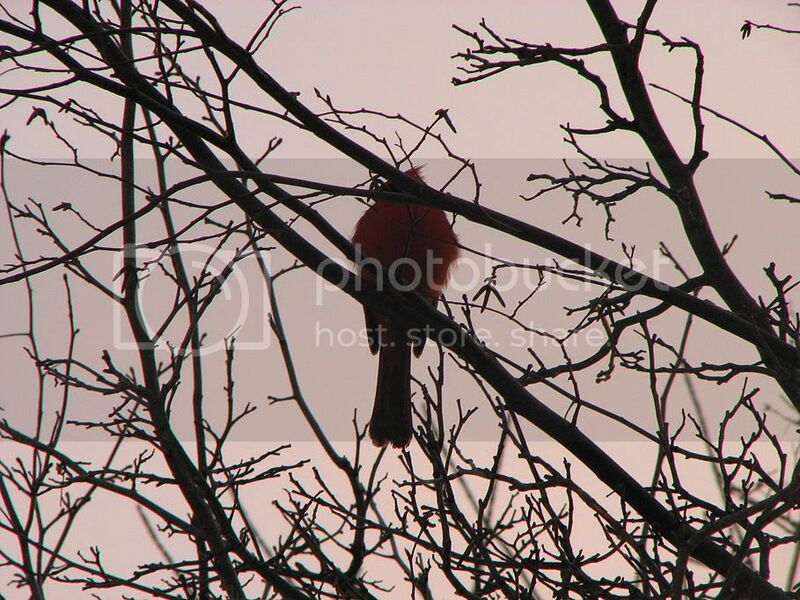 Back at my park, Frank spotted this cardinal perched on a branch. Only a hint of his typical bright red shows up in the dusky light. 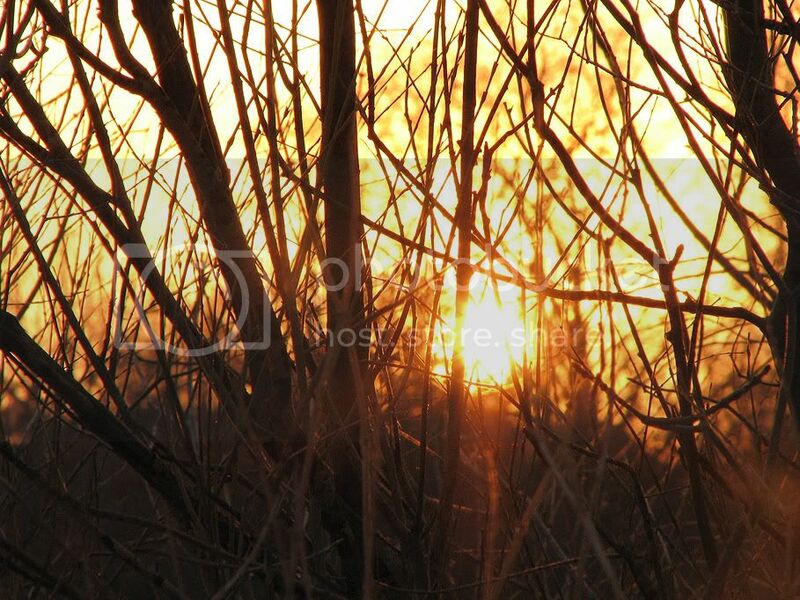 I took a few shots of the setting sun as it lit up the tree branches. I couldn't decide which one to post, so I've included them all. The park was on fire with golden sunshine. Fiery colours light up the branches. 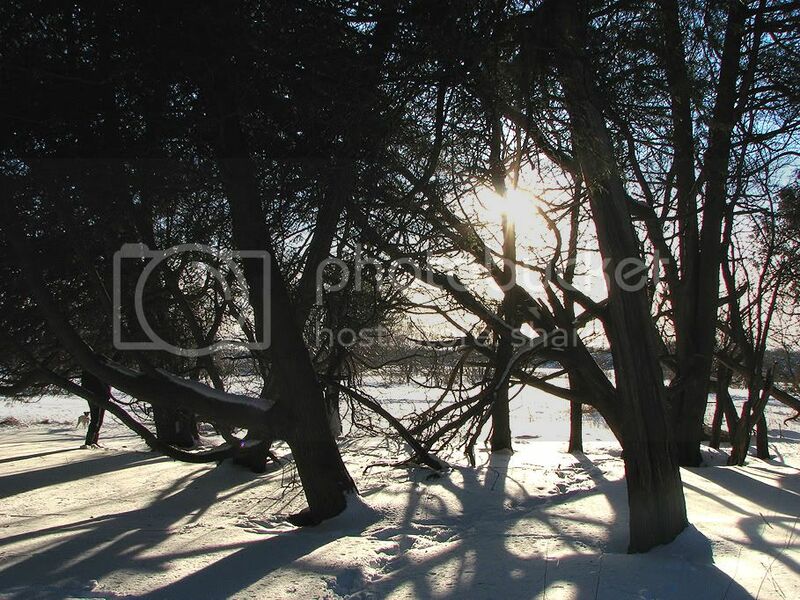 Trees reach out and cast their shadows in the late day light. The lake reflects the warmth of the colourful sky. The sky's colours deepen over the rooftops. It's time to go home for a drink. On Monday morning I thought about a nearby area which a neighbour mentioned to me just days before. She told me of how she crosses one of the main parkways bordering our park, and enters into the valley on the opposite side. 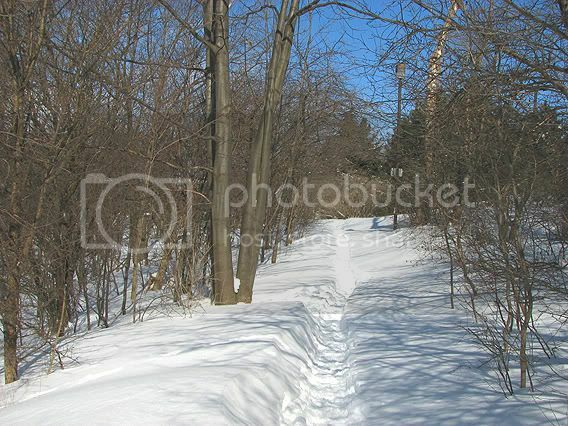 She warned that passage was difficult with newly-fallen snow because very few people seem to know about the area. Hers are the only human footprints she usually sees on her regular strolls. I decide to add mine to them that day. I tend not to be terribly adventurous on my own. I'm the kind of person that prefers to explore and share new finds with somebody else, so I considered waiting for the next weekend when I could probably convince Frank to come along with me. But that annoying voice in the back of my head kept telling me to scout it out first. "It might turn out to be a boring trek and I don't want to be dragged all over Hell's half-acre and back for nothing." Yes, that voice belongs to Frank. 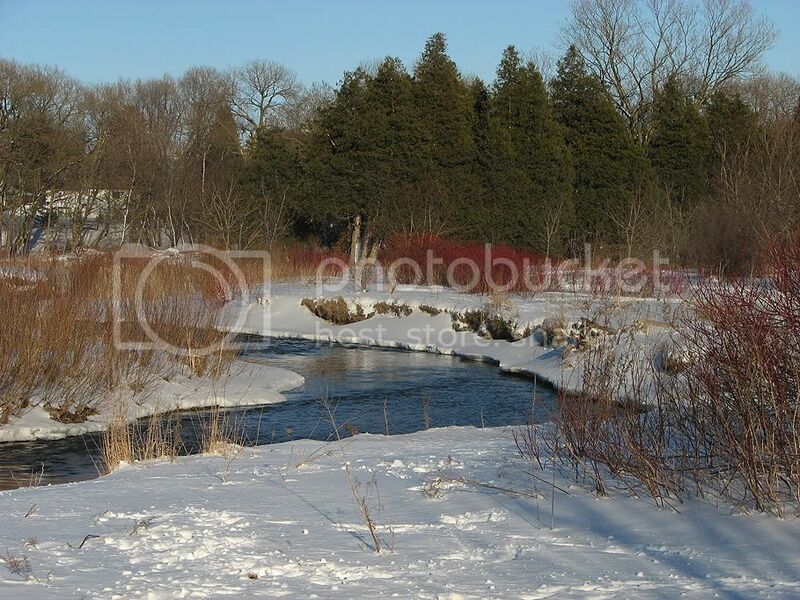 So, with my camera slung over my shoulder, I made the nerve-wracking traverse up and over the snowbanks and across our area's busiest road, into the valley of the creek which runs away from our pond. 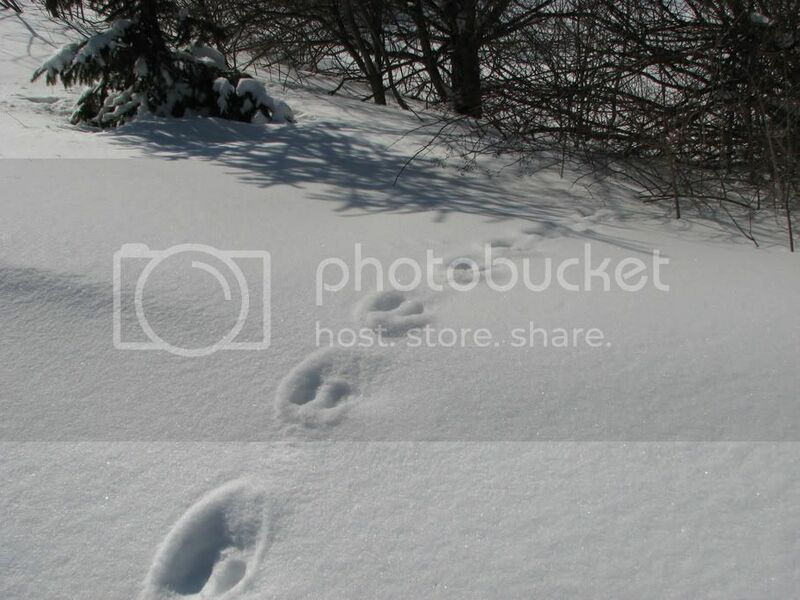 At first I saw footprints, and I followed them knowing I was probably in the right place. They stopped abruptly though, and I realized that someone had determined that the snow was too deep to continue. This person had likely turned around and retreated by matching his or her own steps. I decided to continue onward. Several times, I thought it might be best to return another day, but my feet kept taking one sinking step after the other. I stopped occasionally to look up and around, or to unzip my jacket and remove my gloves, or snow from my boots. The sun was reflecting strongly, reminding me that despite the knee-deep fluff, spring truly was around the corner. 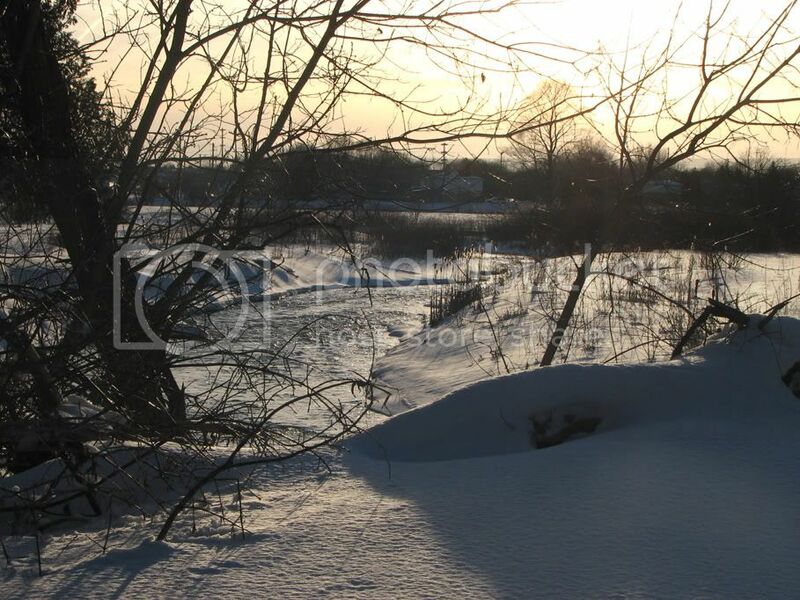 I trudged amid rabbit and other animal tracks for about a half-kilometer, noting the strange combination of nature and industrial surroundings. To my right was the creek, fed from the lake in our park, and which runs into the Credit River and ultimately Lake Ontario. To my left was a large car dealership with outdoor loudspeaker which occasionally blared announcements of incoming phone calls for one employee or another. 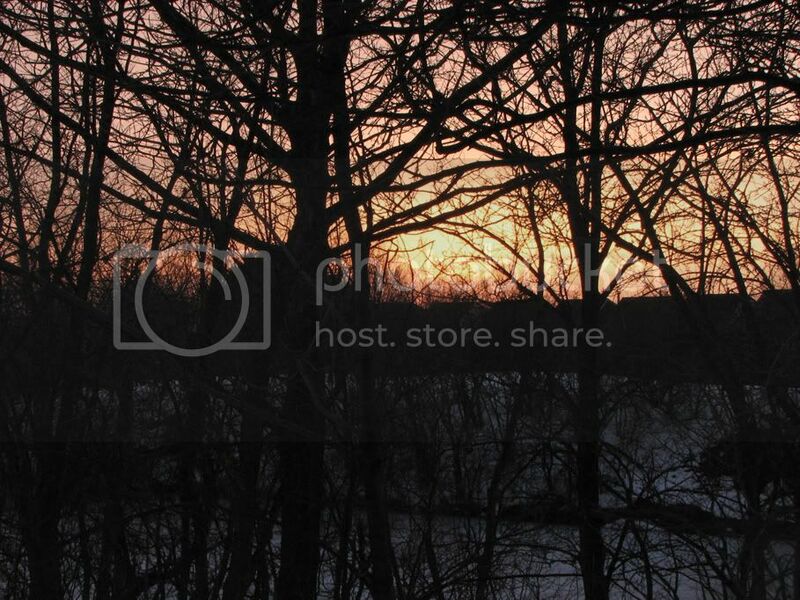 Despite these interruptions, I could easily focus on the beauty around me. On my right, the creek babbled as it wound its way toward open water. A mini waterfall sang loudly. 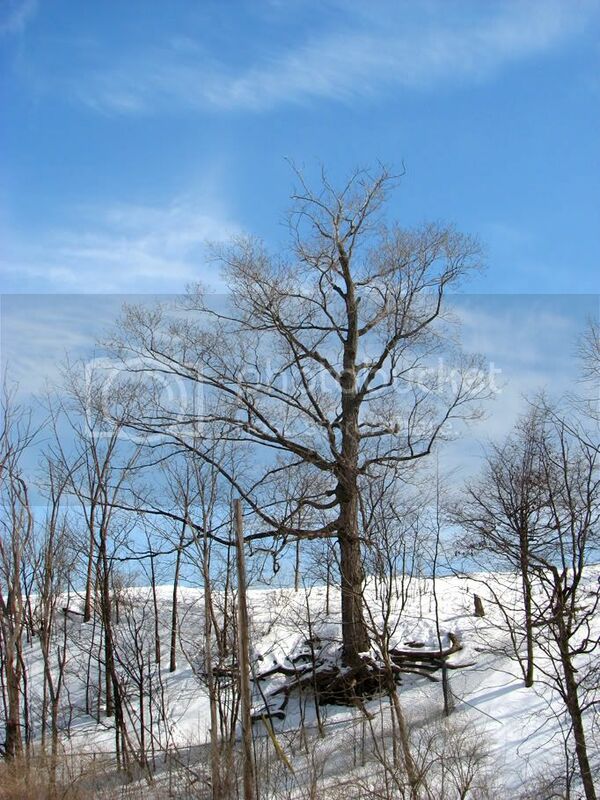 This beautiful old tree on the far side of the creek seems barely rooted to the lower part of the slope. Looking up, I could see various birds in flight. 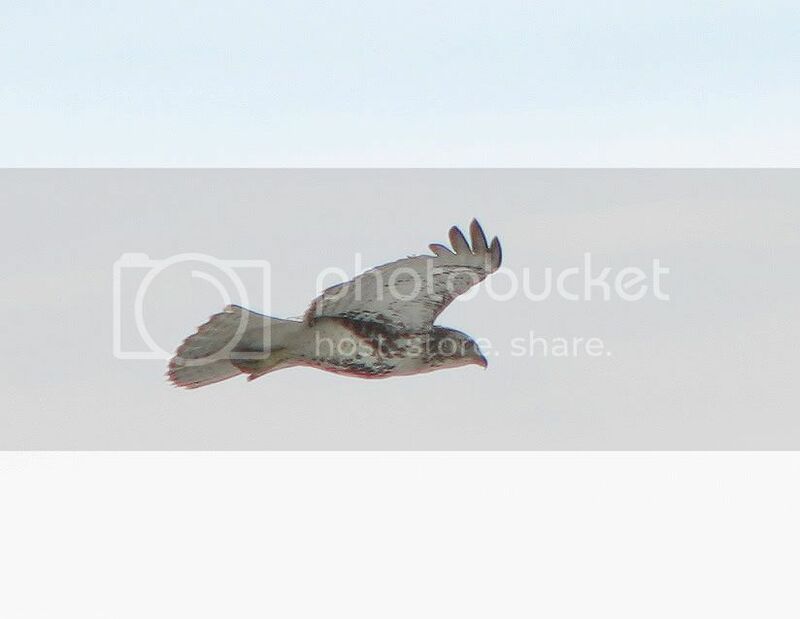 Two hawks soared together just outside of my camera's range. They appeared to be weaving toward and away from each other, in a majestic dance across the sky. 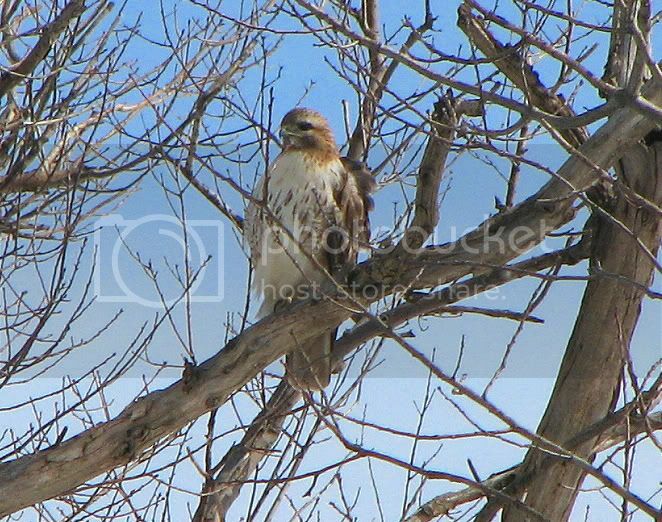 Occasionally, one or the other would veer in closer to me and I was able to take a couple of shots (Please click on each image for a slightly larger view). 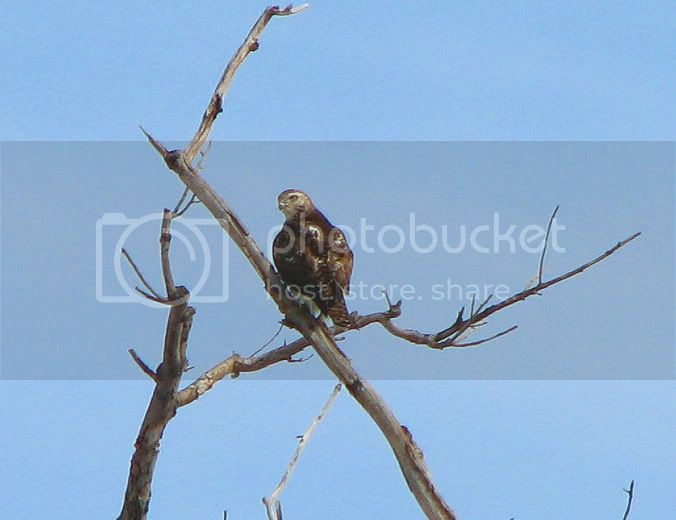 This one traveled from tree to tree, in search of a better vantage point from which to assess his surroundings. 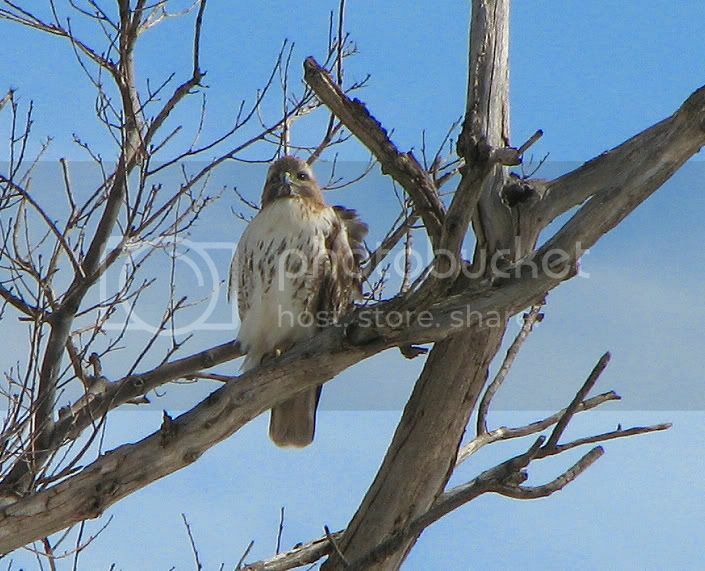 Eventually I was able to focus on a couple of different hawks as they landed briefly in the branches above. My wishes alternated between a closer landing and a better zoom. 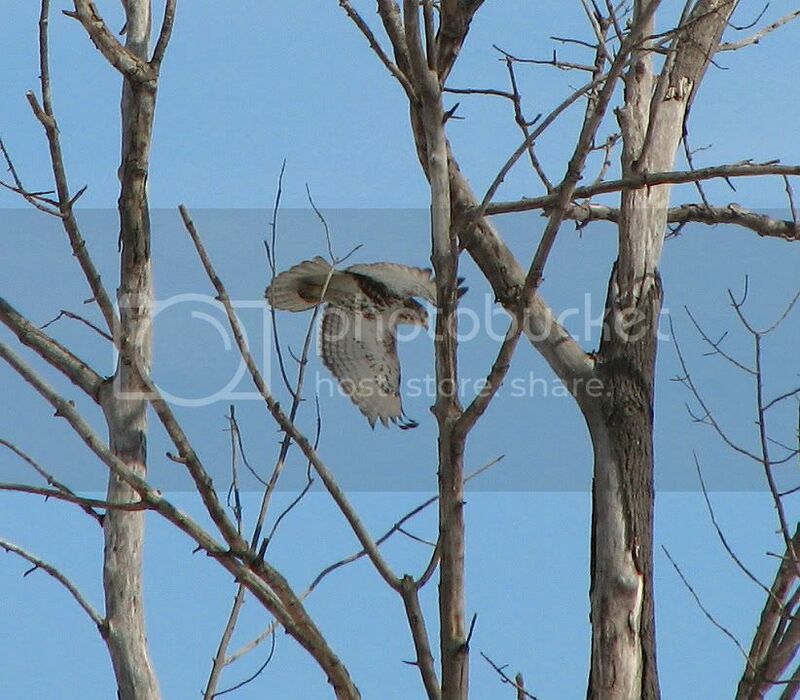 As I continued walking, a hawk landed on a tree branch almost directly across the creek from me. I focused my camera and captured several shots. This noble creature reacted to every subtle sound a split-second before it became audible to me, and it watched my every movement as I waited for it to tire of sitting still. Alert to every sound, he would turn toward the direction of the loud speaker an instant before I could hear its announcement. 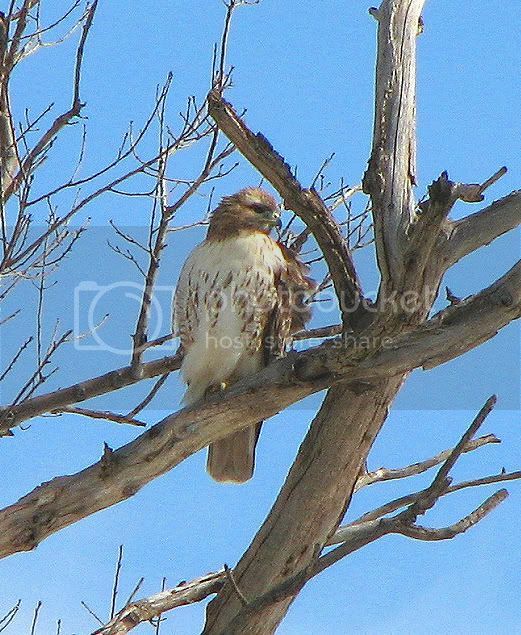 I surmised that the hawk might hear a crackle from the speaker which was not within my own hearing range. I had hoped to capture its departing flight but it proved to be more patient than I was. I continued onward after at least fifteen minutes of vigilant observation. A few more steps and I'd focus again but he wouldn't budge. Finally, I decided to explore just a bit further along the bank of the creek, a bit fearful of stepping too close to the slope, lest there be a sudden drop that I couldn't detect beneath the blanket of snow. 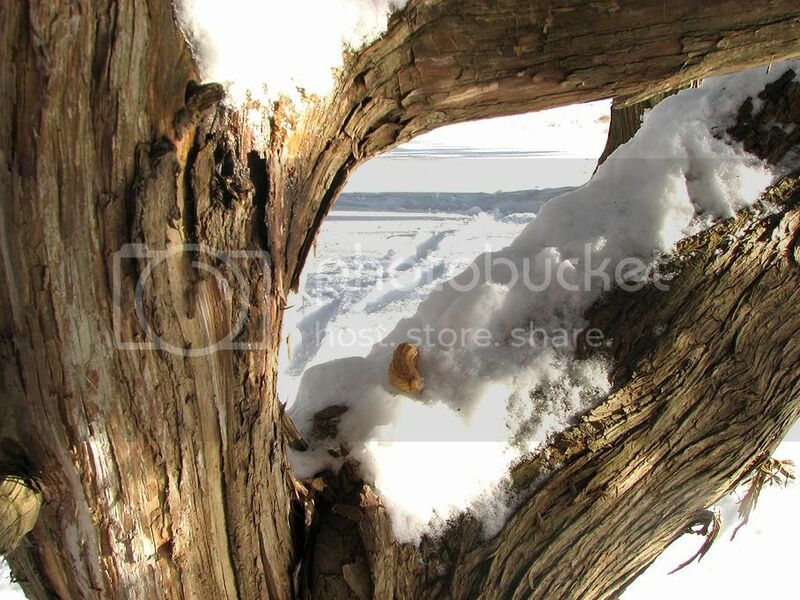 A moment later, the snow was getting deeper and more difficult to navigate, so I decided to return, only to find that the bird had departed silently while my back was to him. I can only hope that winter takes leave as quickly. We're comfortably settled into March, which means that temperatures should be warmer, snowfalls less frequent and newly-sprouted greenery more apparent. None of this has happened yet this year -at least not for long. This past weekend brought our biggest snowstorm of the season. It began rather timidly on Friday afternoon, hesitating occasionally, deceiving us to trust that it might have spent its burden and moved on. We knew better though. We'd been listening to various news stations and weather channels, all which told us that the brunt of the storm would lurk for a few hours and then swoop in overnight. 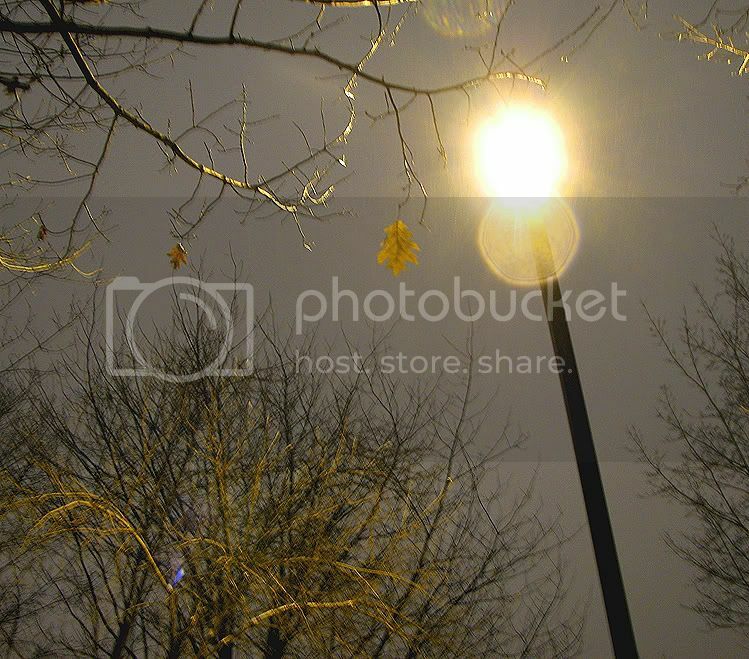 We took advantage of the lull and wandered around the local pathways at night. This shadow on the pathway caught my eye and my curiosity. Since there are several light sources along the route, it took us a moment to determine where the actual leaf was. 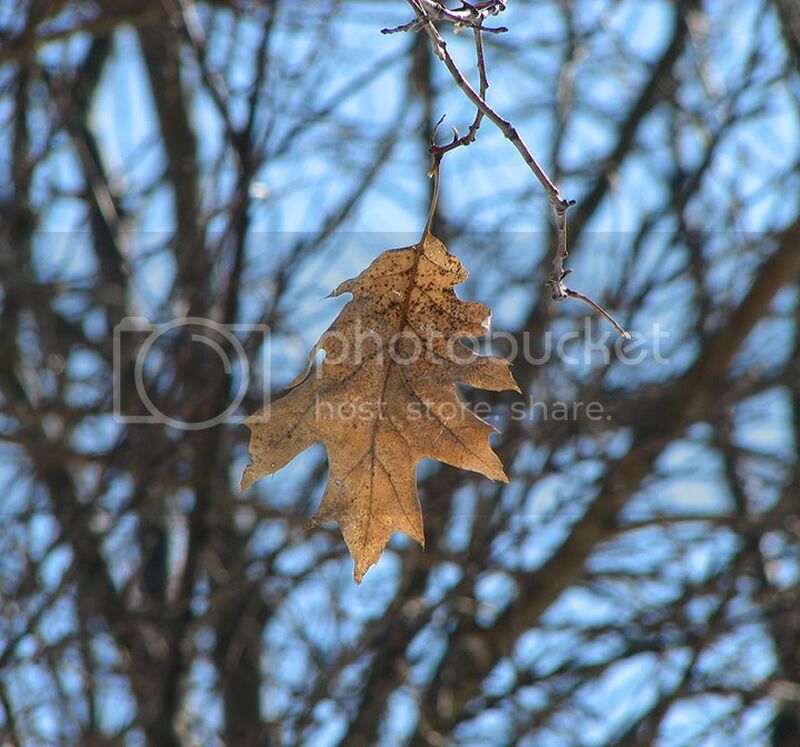 Looking up we found the single leaf clinging to its branch. Two days later, I was able to locate the same leaf in the light of day. Once we were back in the warmth of home, the storm began in earnest. We awoke to several centimetres of the freshly-fallen fluff, and it continued to blow, swirl and accumulate throughout the day and into the following night. 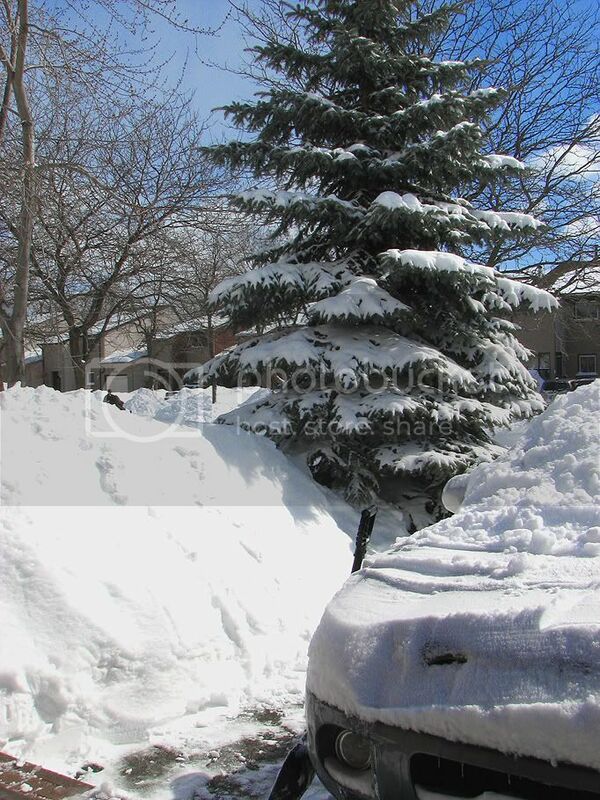 By the time it was over, we'd endured an additional thirty centimeters (12 inches). 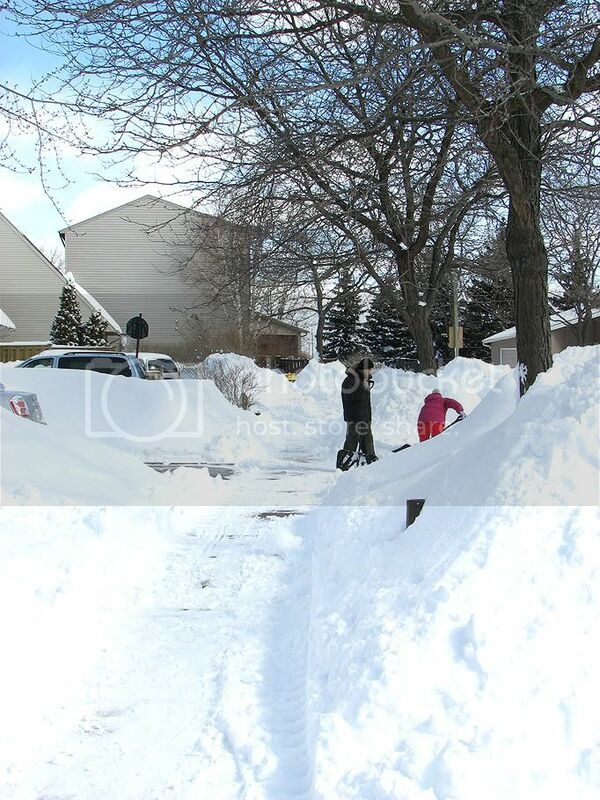 The task of shoveling our way out became more challenging as we struggled to find a place to toss it. 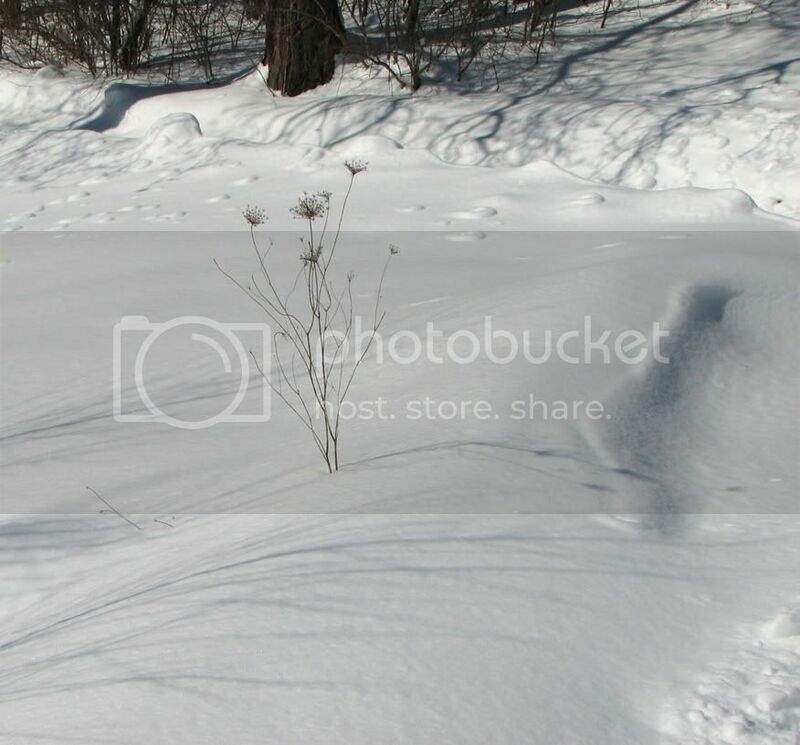 The drifts and previously-shoveled snow had created banks that were taller than I am. We completed the task in several shifts. Neighbours were out working away at their own driveways, stopping only to comment on what a persistent winter we've been having. Snow drifts dwarfed the cars parked alongside them. 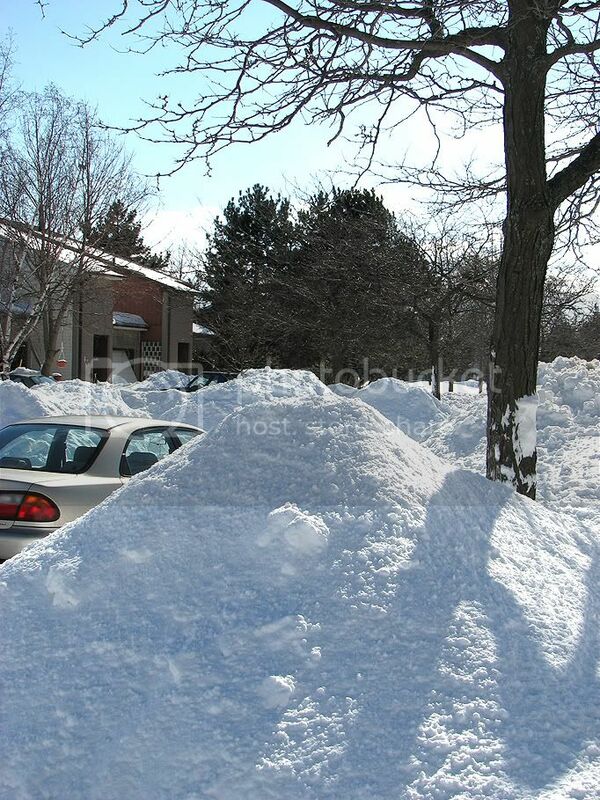 Our own driveway was a challenge. Just how high can we possibly toss this stuff? By Sunday morning, the clouds had moved on, and the sunlight which reflected off of the drifts was intense. In the afternoon, I decided to take a walk in the park. Paths had scarcely been etched by previous travelers but it was enough to adequately allow passage. I snapped a few photos and headed to the warmth of home. There's no doubt that this season has brought some wondrous beauty but now I'm becoming just a bit anxious for spring to arrive. 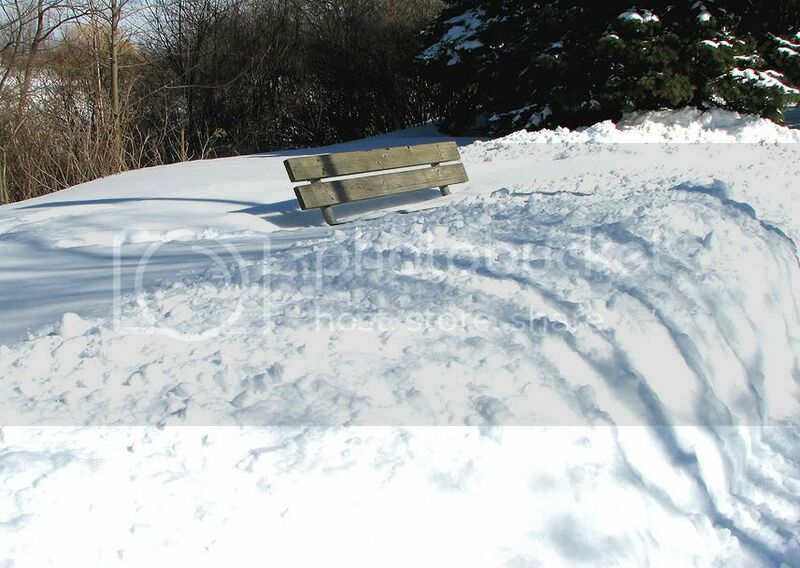 This park bench is a good measure of the snow's depth. 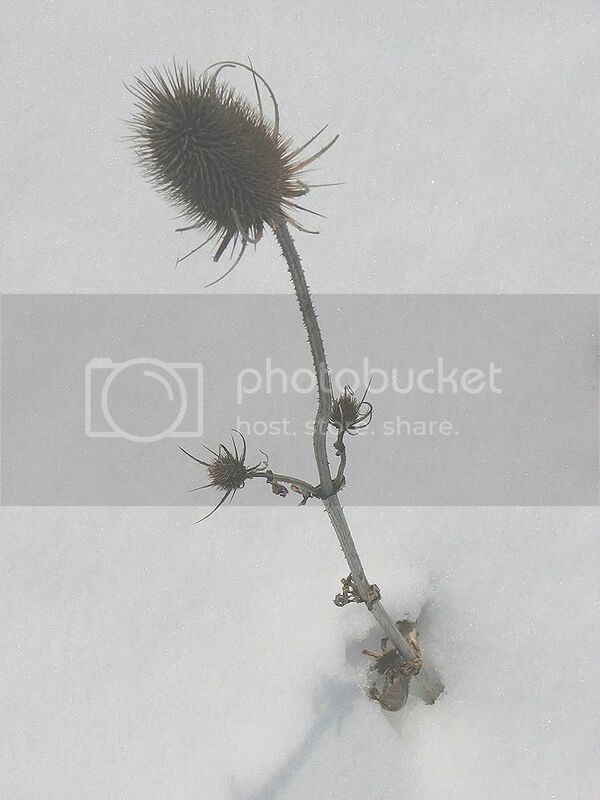 A thistle stands tall in spite of the recent blizzard. So does this stem of Queen Anne's Lace. Rabbit tracks were everywhere I looked. They seemed to be less defined because of the deep snow. In a few days, I'll post some images that were taken on yesterday's excursion - one which caused plenty of snow to find its way inside my boots. Stay tuned! We Have Winners.. Tink & Jenn!